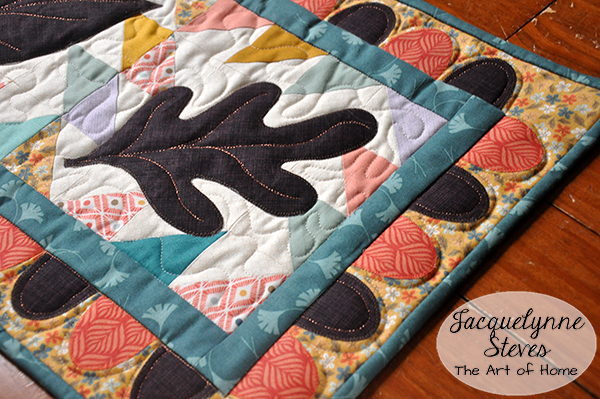 « 19 Free Bird Projects to Sew! 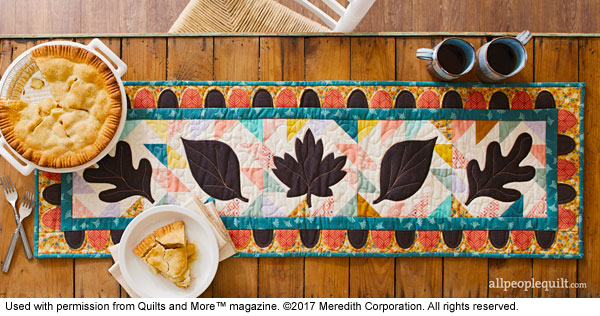 My Autumn Table Runner in Quilts & More Magazine! I can’t believe we are halfway through 2017! 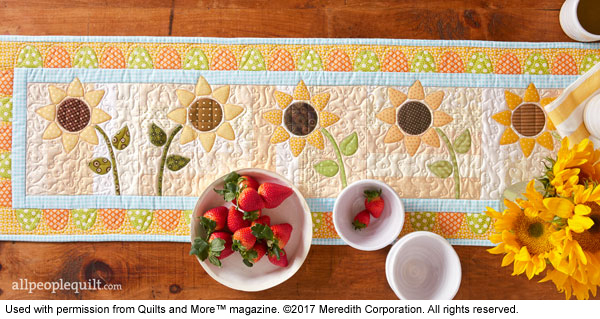 It’s been really fun to have my table runner projects featured in each issue of Quilts & More magazine this year. 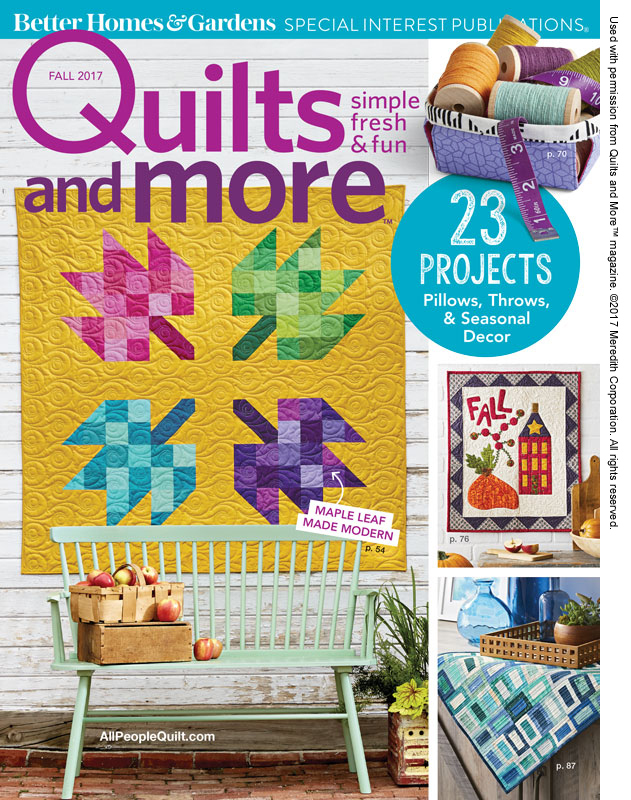 TODAY the autumn issue will be released- so check your newsstands or local quilt shop, or if you have a subscription run right out to the mailbox to see if it’s arrived! You can also get a digital copy here. My quilter, Danny, used metallic thread for the veins in the leaves, it adds a really pretty, shimmery touch, don’t you think? I wonder what the Holiday issue will have in store for us????? Don’t forget to get your copy before they sell out! 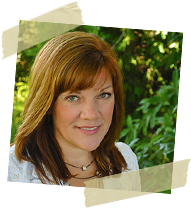 This article was posted in Art-Design-Business, Autumn, Books & Publications, Featured, Sewing & Quilting. Bookmark the permalink. Follow comments with the RSS feed for this post.Post a Comment or leave a trackback: Trackback URL. I love being able to change out things like pillows and table runners with the changing seasons. These are just beautiful. I love your color choices for the Fall leaf one. I think I may use it for my color palette in the next rug I’m hooking called “Fall Leaves”. Thank you for the inspiration. You’re a genius! 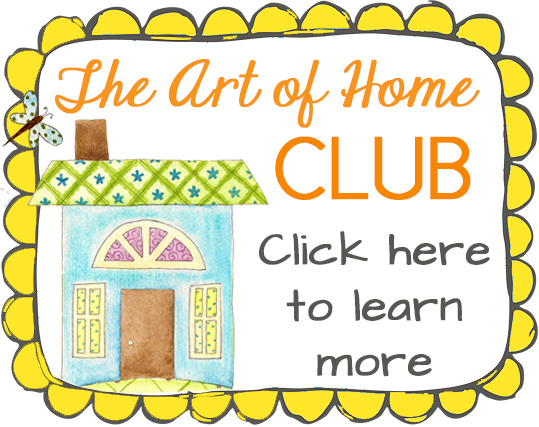 I cannot remember if I signed up for I Love Home bom, should I sign up to be sure? Hi. I particularly like the last one with the sunflowers. Can’t wait to see what you have coming up for Christmas! 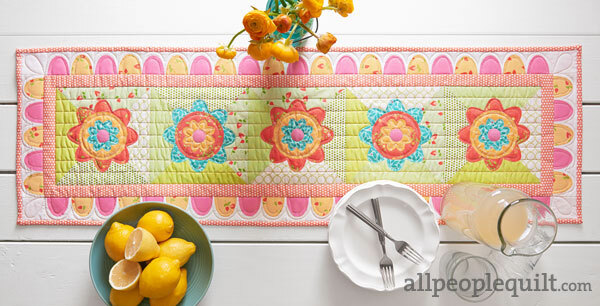 I just started the fall table runner and am having so much fun putting it together. Hi Leslie! I have no idea where to find the patterns in the digital version, I have the print version only. Please contact the publisher- and let me know what you find out in case someone else asks :) Sorry I couldn’t be of more help! I heard back and had also in the meantime figured it out finally. Where it says to find the patterns on Pattern Sheet 2 (or Pattern Sheet 1 for other projects), you actually click on those words – “Pattern Sheet 2” and it will take you to a PDF of the patterns. Now I know for future publications and now you know in case someone like me comes asking in the future. Haha!